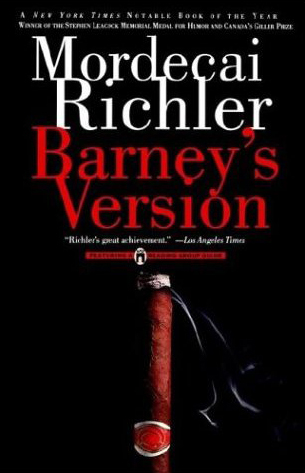 Barney’s Version tells the tale of Barney Panofsky, a Montreal Jew who has married three times, and who was thought to have murdered once. The book is split into three parts “Clara,” “The Second Mrs. Panofsky,” and “Miriam.” Each named after one of his wives. An old man, Pankofsky tells his life story with a lot of memory gaps1, he also tells it without much narrative flow, jumping from the present to the past without much thought. This doesn’t make it an easy read, but it’s an interesting read. The reader isn’t sure about Pankofsky’s honestly, or clarity as he tells his own life story, and adding to that confusion are his son’s footnotes. While there’s drama, in the form of murder, the true heart of Pankofsky’s story is Miriam. While Barney married three times, he only fell in love once, to his final wife. That’s where the crux of the story is, in Barney’s love for Miriam, a woman he knows is completely and totally above him. It’s long-winded, it’s not an easy read, due to the character’s meandering, and side-tracking through the story, but it all adds character to the fictional man writing his biography. It feels real. Whether it’s the casual obsession with hockey, and specifically the Montreal Canadiens, that is loosely littered across the pages, or the casual French during his Clara years, or the Yiddish thrown about all the way through, it creates a real sense of a man. Next on the pile, new 33&1/3 book about Elliott Smith’s XO, Please Kill Me: The Uncensored Oral History of Punk (thanks Anne, my fellow Blogger Bruncher), reading more short stories from Teri Vlassopoulos‘ Bats or Swallows2.